You may or may not have realized by now that there are a few fashion bits that I hoard as religiously as I do beauty products. You guessed right: handbags and sunglasses. But today we're talking about the more summer-essential of the two. 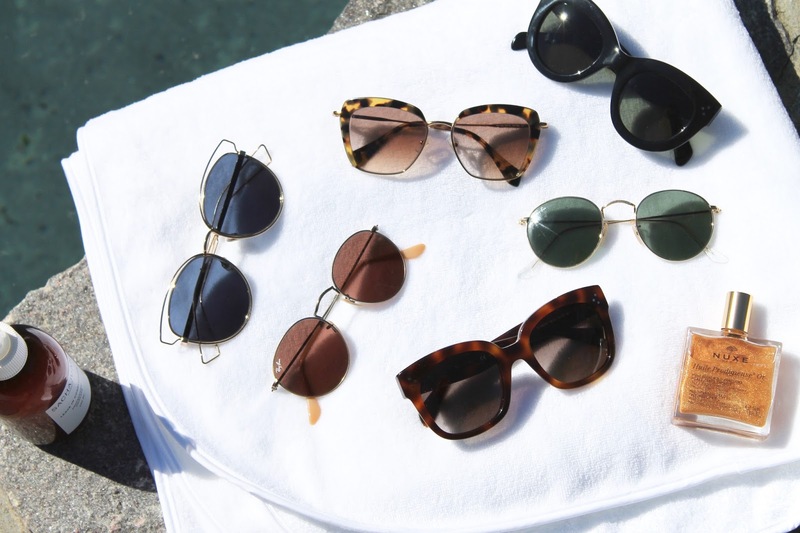 I adore sunglasses, and this year in particular seems to be the best time to whack out (or buy for that matter) those trendy pairs you thought you'd never get the chance to wear. I love the new takes on classics that seem to be popular right now, as well as the multitude of wire-frame pairs, and I also always have a few classic pairs on rotation for those outfits that need something more simple. 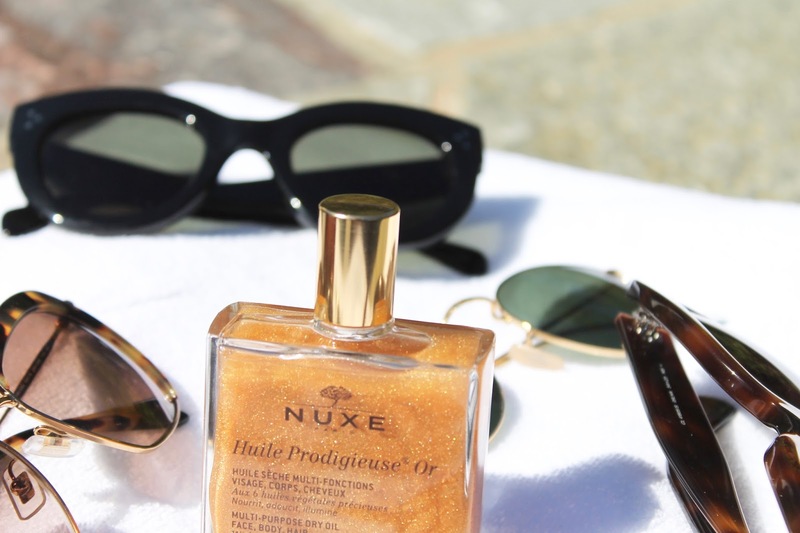 Here are my current favorites...oh, and a quick shoutout to two other summer essentials too - the Sachajuan Leave In Conditioner for silky-bouncy strands, and the Nuxe Huile Prodigieuse Or for that J Lo glow poolside (or as close to you'll ever come to it). I've linked all the pairs below as well, so happy shopping! 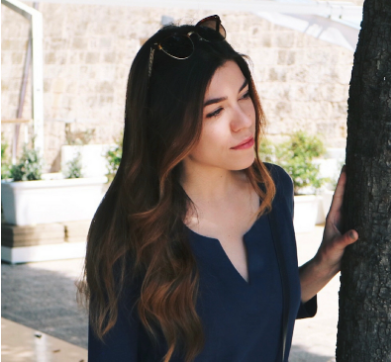 Classics - For really sturdy, chic frames I always love checking out what Céline has to offer. Must have classics include an oversized cat eye in the form of the Céline Caty Sunglasses in Black. A boxier, but equally as chic pair of Céline Audrey 2 Sunglasses in Havana, and of course the Ray Ban Round Classic Sunglasses in Green and Gold Metal. Is there anywhere you haven't seen these Ray Bans this year? They are so amazingly comfortable, make me feel instantly cool, and seem to flatter every face shape. Trendy - If we're talking seriously on-trend sunnies at the moment, this post would be nothing without a mirrored pair. Since I'm loving the Ray Ban Round Classic Sunglasses so much, my current colored favorites are this Red Mirrored pair. I love the red because from a distance it isn't too loud or obvious, but it does add a bit of a fun twist to any look. I've also been into what Dior has to offer lately - over the past year they've absolutely been killing it in the sunnies department. I picked up a new pair a few months back and got an absolute ton of wear out of them while in Spain last week. They are the Dior Sideral 2 and the oversize double-wire frame are sturdy, yet lightweight and cover all manner of sin with their large rounded shape. I think they're so fun and different from anything else I have in my collection, yet they manage to go with just about anything because the palladium frame looks as though it could be both gold and silver, depending on the lighting. I've also always been a Miu Miu devotee, so this roundup was bound to contain at least one pair. My favorites right now are these Square tortoise brown gradient ones, for which I'm unsure of the exact name, but they are linked below. They are so comfortable to wear and I find them to look feminine, yet unfussy. Whenever the weather is too hot to handle really heavy sunglasses, these ones come out to play because I forget I'm even wearing them when they're on. Win!